The coolest months of the year here in Texas are behind us, which means it’s time to start thinking about springtime. If you’d like to plant a garden this year, believe it or not, it’s past time to start getting things prepped. If you’re a little behind, don’t worry; there’s still time to get your yard or garden in shape for spring planting. Not sure where to begin? We’ve got some advice. The best thing you can do this time of year – regardless of your level of expertise with gardening – is to consult with your local nursery. This will help you get a better idea of what types of plants will thrive best in your area, as well as which types will best suit your lifestyle and preferred level of care/maintenance. An experienced nursery worker will also be able to provide recommendations on specific gardening tools and other products that will make caring for your garden easier. Speaking of gardening tools, now is also a good time to dig these out of your garage or shed where they’ve likely been gathering dust throughout the winter months. A little soap and warm water can go a long way in removing caked-on debris from your gardening tools. This would also be a good time to have certain tools sharpened if needed, such as gardening shears. This is something you may be able to have done at your local nursery. If any of your gardening tools are in disrepair or unsafe to use, it’s time to replace them. In Texas, there are quite a few types of plants that can be put in the ground this early in the year. Some examples of these include fruit trees and vines. Which plants are best to start with can vary depending on what part of the state in which you live, so you should consult with a professional if you’re unsure. If you plan on moving any established trees or shrubs from one spot to another, now is also the time to get this done. As you dig, be careful not to disturb the roots; when transporting, do your best to hold soil in place around the roots with your hands for the best chances of transplant success. The pruning and trimming of existing trees and shrubs are important for healthy summer growth. Some common Texas plants that need to be pruned include plumb and peach trees, evergreen shrubs, and summer-flowering shrubs. Consult with a nursery professional to determine how much pruning needs to be done. Some plants, for example, should be trimmed only slightly, whereas others will need up to 85% of their growth removed. One of the most important factors in starting a successful garden this spring is fertilizer to promote healthy soil and plant growth. An all-nitrogen fertilizer is a great way to kick-start the growth of plants in late winter. Before you lay down any soil, however, it’s important that you clean out your gardening beds from the previous year. 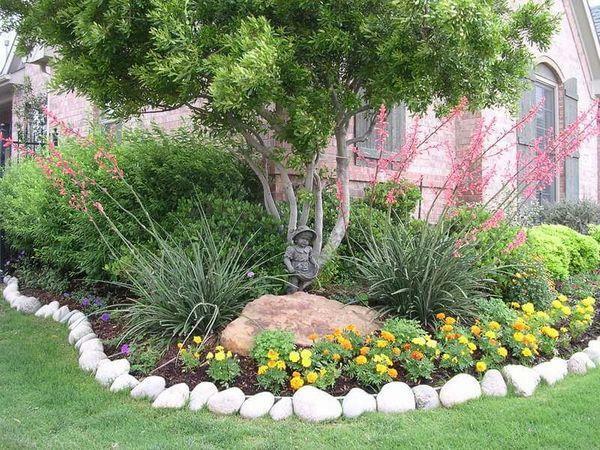 This includes removing any weeds, raking the existing soil, and possibly even adding some compost. Keep in mind that soil will need to not only be nutrient-rich, but also well-aerated if you want any new plants or seeds to have the best chance of healthy growth. Creating a beautiful landscape or garden requires a lot of work, not just now but throughout the spring and summer months as well. If you’re new to this or are simply looking for a professional eye to help, our team at Landscape by Design is here for you. Find out more about our many services offered or schedule your free consultation by giving us a call at (817) 355-1013. From total landscape renovations to new construction landscape design, we do it all, and we’d be happy to help you transform your yard into a dream landscape!